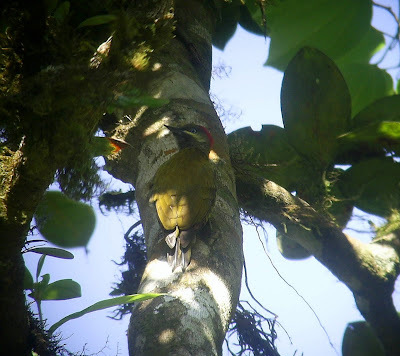 On Wednesday, February 6 at around 10 a.m. John Rowlett (Field Guides Inc.) and Faustino Sánchez (Canopy Lodge) had a Stripe-cheeked Woodpecker at Altos del María, while leading a birding group. This Panama endemic is more frequently reported from the foothills east of the canal, but the British Museum has a 1875 specimen from (possibly) the Caribbean slope of Veraguas. Also, the type specimen was actually collected near the Panama Railroad, on the Atlantic side. Whilst waiting for the full report, here is a photo of the bird in question, taken by Faustino Sánchez.